After growing up in Northern Ireland, Iain Whiteside moved to Scotland to complete his studies. 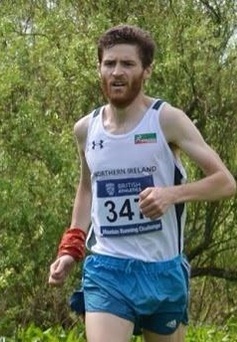 Nearly 10 years later, the Northern Ireland international mountain runner is well settled in Edinburgh, so much so that his mum claims that he has lost his Northern Irish accent, something that Iain enjoys trying to ‘bring back’ when meeting up with his NI team mates. He (Iain), who works as a Researcher for Newcastle University, tries to get into the hills as much as possible, with famous Arthur’s Seat and Pentland Hills being two of his regular haunts; he is often accompanied by his favourite running buddy, Jess, the dog. Iain misses some of the finer things from Northern Ireland, like soda bread and Tayto crisps; oh, and chips (come on Iain, you’re an athlete!). What is your favourite Northern Ireland event? I’m a big fan of mountain marathons and my first ever hill race was the Mourne Mountain Marathon, so I’ll have to go with that. I managed to rope an old school friend into running the ‘C class’ with me in 2010 (the year the weather was terrible), and managed to navigate us almost out of the Mournes and almost to the Bryansford Road when looking for what I’d now (after 10 years in Scotland) call a lochan on Butter Mountain. He’s never forgiven me for making him trudge back up that hill. I keep trying to get back and take on the ‘Elite course’, but it hasn’t happened yet. Next year, hopefully! As you are based in Scotland, do you have a favourite race there? I love big mountains and Arrochar Alps (15 miles, 2,500m) has 4 of them: huge climbs, rough terrain, no paths, and very informal, often with only a couple dozen runners. Great fun! I have a habit/reputation for trying to find new shortcuts in races (basically I’m lazy), and managed to get myself stuck in a river gorge at Arrochar this year, and had to climb down a waterfall to get out! Needless to say, it added several minutes to my time! When did you start running? A friend and I talked each other into running the Edinburgh Marathon way back in 2009 as a way to deal with final year exam stress. I made it to about 15 miles, then had to walk most of the rest! That put me off for another year or so, but I started running a bit more seriously a few years into my PhD and quickly got hooked. Why do you run? Haha, the classic question. I love it: it’s my favourite thing to do. There really is no better feeling than being alone in the hills (or with just my dog!) in howling gale and horizontal rain, battling the elements; or, equally, a beautiful still, sunny day. Perfection. You have been in good form this year… You must be happy with this!? Can you put your finger on any particular reason for this good form? Yes, I’ve managed to fluke a few good results and feel stronger than previous years. I think it is a combination of consistency of training without injuries and avoiding over-racing by having some key goals for the season. That said, I’m just back from three weeks hiking in the Alps and feel like I’ve forgotten how to run! Monday: Fartlek, fairly fluid, no set times for efforts. Depending on how hilly I feel my weekend has been, I’ll either do it flat, undulating, or in the hills. Tuesday: Flat intervals: I generally to do more endurance reps, but stick in some sprints every few weeks. Wednesday: I’ll usually head to the hills for 90mins at a fairly easy pace. Thursday: Hill reps: also endurance based, but with the odd horrifically painful sprints session. Friday: Usually an easier day, with a quick hill climb. Saturday: Depending on Sunday, it’ll be hills or roads; sometimes a session or race. Sunday: Either a long road run (2hrs) or long hilly run (3hrs). What is your favourite training ‘session’? I’d say my least hated session is 10x1mins hill reps, which I often do if my motivation is very levaquin low. I’m not sure why, since it is one of the most painful, but at least it’s over fairly quickly! What is your next race and what do you want from it? It’s getting to fell relay season here, and I am organising and running in the Carnethy HRC teams for the British Fell Running Championships, which we hope to field a strong team for. I’m also in California for a month’s work in December and rashly signed up for a 50miler. Eek! Do you feel living away from home adds to the experience of running for NI? Yes, definitely. I absolutely love coming back home and wish I took up running earlier as the hilly roads out the back of Larne are a great training ground for any runner. Normal training tends to be put on hold when I’m home and I just do long runs! The Mournes are magic: I loved them as a hill walker, and it’s even better when you can run round most of them in a day! I’ve also made good friends within the NI squad, and it’s nice to get across to race against them or train with them. A few of us a trying to organise some training camps for next season, so hopefully I can make it across more often! You are pretty speedy away from the mountains as well, in particular, your 1:14:39 at the Conwy Half Marathon at the back end of 2013 was pretty impressive. Any plans to go back onto the road soon? Ah, yes: my two week road running career… There’s a bit of a story behind this: my partner, Megan Crawford, was aiming for a Commonwealth Games marathon qualifying time at London, and her coach thought it would be a good idea for me to pace her round it. I was happy with this: she had a better marathon PB than me, so I secretly planned to outsprint her in the last few hundred yards. To get into London, I needed to run sub 75mins at 2 weeks notice! There were only two half marathons not sold-out before the application deadline, and we signed up for them both. The first, Fraserburgh Half in the North East of Scotland, was flat as a pancake, and Conwy, down in North Wales, (very much the backup plan) went over a whopping great hill! Of course, with my luck a marshal hadn’t marked a turning in Fraserburgh and I ran an extra half mile and missed the time. At the top of the hill in mile 8 in Conwy, my watch was telling me I was on target for 1:19, and I had to leg it downhill and scraped through by the skin of my teeth. My quads were sorer the next day than they ever have been after a hill race. And London… well, I somehow strained my groin putting on my shoes 20 minutes before the race and had to drop out in agony after 13 miles. So, I will go back to run another marathon, if only to wipe the memory of my DNF! What is your favourite pre-race and post-race meals? Pre-race, I tend to stick to stereotype and have a very potato-based meal! Sounds posh, but Potato Dauphinoise is my favourite and is just creamy cheesy potatoes! Though, recently Megan’s been feeding me a butternut squash risotto, which is also very good. Post-race, I usually go for pizza every time (and a pint of milk straight after!). What would you consider to be your greatest achievement in running? Carnethy HRC, the club I run for in Scotland, recently became the British Fell Running Champions: the first non-English club to ever do so (in the Senior male category anyway), and I was very proud to be counting in each of the races (and play a big role with my 2nd place at Slieve Donard!). I’m also very proud to have represented NI on several occasions and, though I’ve never had a good race in an international vest, I hope to have another opportunity next year! What is your running ambition? I’d love to get into the top three in the British Championships in a few years time. I was close to the top 10 this year, so it’s a big step up. 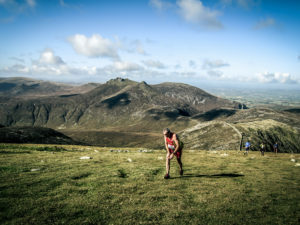 I’d also love to win the Mourne Mountain Marathon and maybe a few of the classic races in the UK! 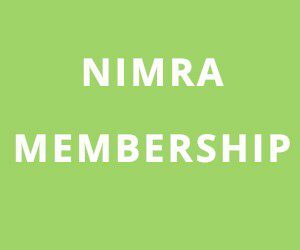 Are you interested in any other sports away from running? I guess fairly typically for a hill runner, I do a fair bit of climbing, cycling, skiing when I get the chance. I used to play a lot of football until the classic knee cartilage injury!